Time for one of those mad, rambling posts that start at one point and end up somewhere completely different. Much like me on a bike ride! And cycle I did. The bike is made by ‘Sweet Bunny’ and is their ‘Pinkie Cycle’. Now, regular readers know I hate pink, BUT I actually really love the vibrant pink on this cycle because it’s really bright and in your face and actually not too Barbielicious if you ask me. Even better than that, it’s mesh. You wear it and move as you normally would, and that’s it. There’s a cycling animation built-in and you can click the bell to make it ring (the sweetest little ting-ting tinkle) and it also makes a nice noise as you pedal too, the sound of spokes on wheels creaking as they turn. (A noise that evokes happy summer holiday memories from when I was a kid.) There’s even a basket on the front which you can show/hide. I thought about filling my basket with prim nommage and going for a picnic, but then I realised it was a bad idea because I planned on cycling very fast and nobody likes it when your pop explodes and your sandwiches get soggy. It’s a fantastic creation, and brilliantly done. A really thoughtful gift that I was so lucky to receive. 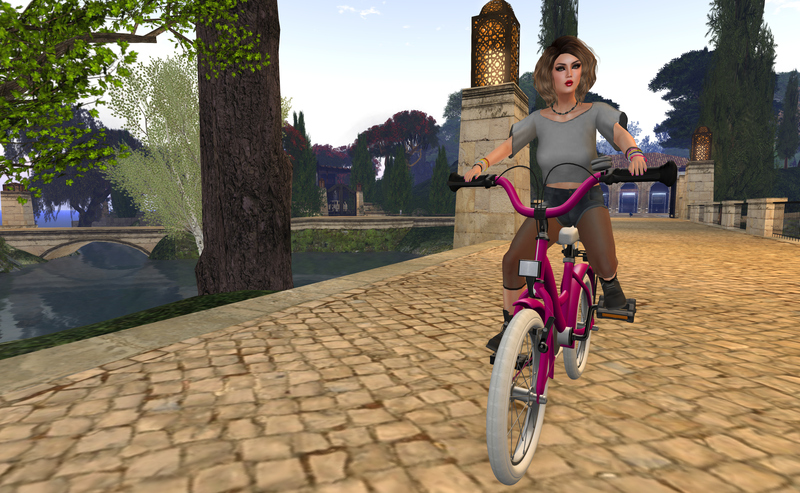 I rezzed Bessie (yes, I have named my bike)at The Grove and went for a cycle. And spent many happy hours in cycling bliss. You’re probably wondering did I establish who my anonymous benefactor was? Well initially I thought it was Mands, as she often treats me to random gifts because she is lovely like that, but no, it wasn’t her. This meant I had no clue who it could be, until a discreet plurk disclosed my generous chum, and they were thanked heartily. Plurk gets a LOT of stick for the inherent drama that often kicks off amongst the plurking Second Life community. It can be a harsh environment, and I’ve realised that the only way to deal with it is to watch from the sidelines. Oftentimes issues blow over, but some have led to lasting hurt, scurrilous gossip and betrayals. It can be very upsetting but the thing is with drama you can choose NOT to be involved. There’s a famous saying that is incredibly true, “If you can’t say anything nice then don’t say anything at all”, and I confess I find myself thinking that phrase out loud when biting my tongue just isn’t enough. But as my gift proves, there is a lot of love and caring on Plurk too. If you’re having a bad day and put it out there you soon find yourself enveloped in virtual love, hugs and support. I’ve learned so much about people, and shared so much of myself on there to friends I’ve never met and been rewarded with nothing but love and caring. As a support network it’s actually proven to be second to none. Last night was the ‘Pixel Prom’, and Harlow Heslop (amazing blogger) plurked about how excited she was about it. I’ve never been to a prom before, although they’re popular in UK schools now they weren’t a ‘thing’ when I left mine (which makes me feel incredibly old.) I always wanted to attend one as a teen, a passion I developed due to my love for John Hughes movies. It’s the first time in my entire Second Life that I’ve been amongst so many avatars all at once. At one point while I was there, there were well over 120. It was also amazing to see how many ‘SLebrities’ I recognised from Second Life that were in attendence, and of course names from my Plurk timeline. According to Harlow at one point there were 135 avatars dancing around to Anubis Darkwatch’s outstanding DJ set, which featured classics from Backstreet Boys, N-Sync and, erm, Mr. Blobby. When I left, after being there to witness the entire gathering get rick-rolled, I went to bed with an extreme case of the warm and fuzzies. I wouldn’t be on Plurk without Second Life. And I wouldn’t have met so many amazing people if it wasn’t for Second Life, for which I will be eternally grateful. 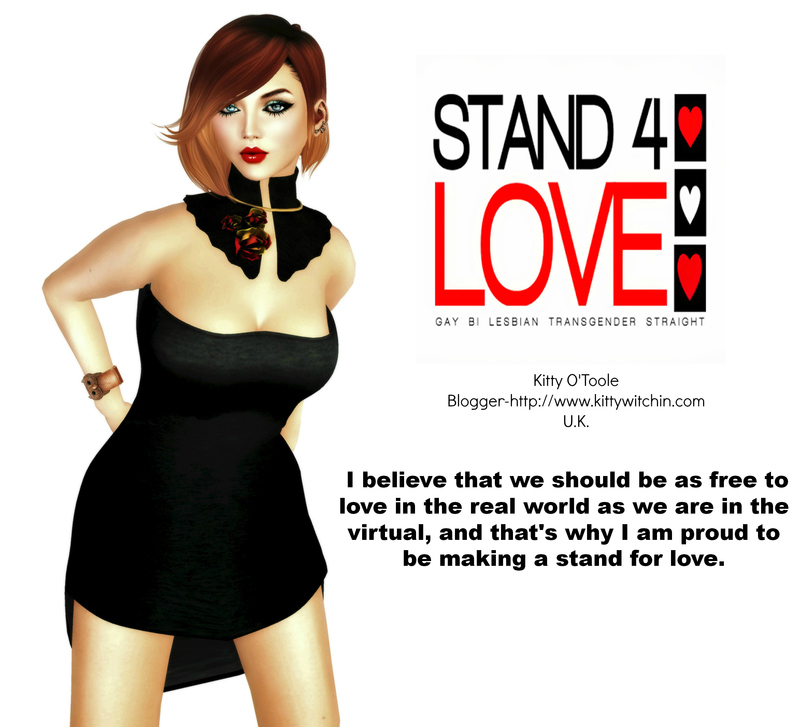 Happy Birthday Second Life. Thanks for ten years of madness, creativity and imagination, and may you reign for many more birthdays to come!